Last week, reporter Solomon Kifle of the Voice of America (VOA-Amharic) heard the terrifying voice of an African police state from thousands of miles away. The veteran reporter was investigating widespread allegations of targeted night time warrantless searches of homes belonging to Ethiopian Muslims in the capital Addis Ababa. Solomon interviewed victims who effectively alleged home invasion robberies by “federal police” who illegally searched their homes and took away cash, gold jewelry, cell phones, laptops, religious books and other items of personal property. One of the police officials Solomon interviewed to get reaction and clarification was police chief Zemedkun of Bole (an area close to the international airport in the capital). Police Chief Zemedkun: Yes. You are correct. VOA: There are allegation that homes belonging to Muslim Ethiopians have been targeted for illegal search and seizure. I am calling to get clarification. Police Chief Zemedkun: Yes (continue). VOA: Is it true that you are conducting such a search? Police Chief Zemedkun: No, sir. I don’t know about this. Who told you that? VOA: Individuals who say they are victims of such searches; Muslims who live in the area. Police Chief Zemedkun: If they said that, you should ask them. VOA: I can tell you what they said. Police Chief Zemedkun: What did they say? VOA: They said “the search is conducted by police officers; they [the police] threaten us without a court order; they take our property, particularly they focus on taking our Holy Qurans and mobile phones. Such are the allegations and I am calling to get clarification. Police Chief Zemedkun: Wouldn’t it be better to talk to the people who told you that? I don’t know anything about that. VOA: I just told you about the allegations the people are making. Police Chief Zemedkun: Enough! There is nothing I know about this. VOA: I will mention (to our listeners) what you said Chief Zemedkun. Are you the police chief of the sub-district ( of Bole)? Police Chief Zemedkun: Yes. I am something like that. VOA: Chief Zemedkun, may I have your last name? Police Chief Zemedkun: Excuse me!! I don’t want to talk to anyone on this type of [issue] phone call. I am going to hang up. If you call again, I will come and get you from your address. I want you to know that!! From now on, you should not call this number again. If you do, I will come to wherever you are and arrest you. I mean right now!! VOA: But I am in Washington (D.C)? Police Chief Zemedkun: I don’t care if you live in Washington or in Heaven. I don’t give a damn! But I will arrest you and take you. You should know that!! VOA: Are you going to come and arrest me? Flying off the handle, exploding in anger and igniting into spontaneous self-combustion is the hallmark of the leaders of the dictatorial regime in Ethiopia. The late Meles Zenawi was the icon of spontaneous self- combustion. Anytime Meles was challenged on facts or policy, he would explode in anger and have a complete meltdown. Finally, when I asked the Prime Minister to work with the opposition and show respect and tolerance for those with differing views on the challenges facing Ethiopia he said, ‘I have a file on all of them; they are all guilty of treason.’ I was struck by his all-knowing tone. Guilty! 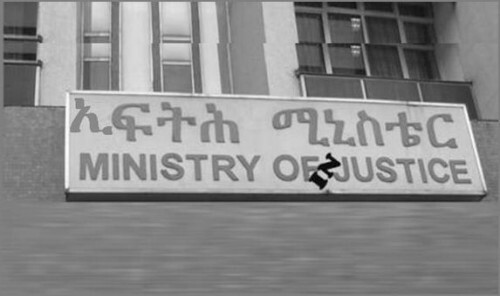 They’re all guilty simply because Meles says so? No trial? Not even a Kangaroo court? I urged Prime Minister Meles not to take that route. Meles routinely called his opponents “dirty”, “mud dwellers”, “pompous egotists” and good-for-nothing “chaff” and “husk.” He took sadistic pleasure in humiliating and demeaning parliamentarians who challenged him with probing questions or merely disagreed with him. His put-downs were so humiliating, few parliamentarians dared to stand up to his bullying. Internationally acclaimed journalists Eskinder Nega, Reeyot Alemu, Woubshet Taye are all victims of arbitrary arrests and detentions. So are opposition party leaders and dissidents Andualem Arage, Nathnael Mekonnen, Mitiku Damte, Yeshiwas Yehunalem, Kinfemichael Debebe, Andualem Ayalew, Nathnael Mekonnen, Yohannes Terefe, Zerihun Gebre-Egziabher and many others. What a crock of …! When Meles massacred 193 unarmed protesters and wounded 763 others following the elections in 2005, he set the standard for official accountability, which happens to be lower than a snake’s knee. For over two decades, Meles created and nurtured a pervasive and ubiquitous culture of official impunity, criminality, untouchability, unaccountablity, brutality, incivility, illegality and immorality in Ethiopia. The frightening fact of the matter is that today there are tens of thousands of mini-Me-leses and Meles wannabes in Ethiopia. What police chief Zemedkun did during the VOA interview is a simple case of monkey see, monkey do. Zemedkun could confidently threaten VOA reporter Solomon because he has seen Meles and his disciples do the same thing for over two decades with impunity. Zemedkun is not alone in trashing the human rights of Ethiopian citizens. He is not some rogue or witless policeman doing his thing on the fringe. Zemedkun is merely one clone of his Master. There are more wicked and depraved versions of Zemedkun masquerading as ministers of state. There are thousands of faceless and nameless “Zemedkunesque” bureaucrats, generals, judges and prosecutors abusing their powers with impunity. There are even soulless and heartless Zemedkuns pretending to be “holy men” of faith. But they are all petty tyrants who believe that they are not only above the law, but also that they are the personification of the law. Freedom from arbitrary arrest and detention, unbeknown to police chief Zemedkun, is guaranteed by Article 17 (Liberty) of the Ethiopian Constitution: “No one shall be deprived of his liberty except in accordance with such procedures as are laid down by law. No one shall be arrested or detained without being charged or convicted of a crime except in accordance with such procedures as are laid down by law.” Article 19 (Rights of Persons under Arrest) provides, “Anyone arrested on criminal charges shall have the right to be informed promptly and in detail… the nature and cause of the charge against him… Everyone shall have the right to be… specifically informed that there is sufficient cause for his arrest as soon as he appears in court. Zemedkun is ready to arrest the VOA reporter simply because the reporter asked him for his last name. What arrogance! What chutzpah! It is a mystery to police chief Zemedkun that arbitrary deprivation of liberty is also a crime against humanity. Article 9 of the 1948 Universal Declaration of Human Rights decrees that “no one shall be subjected to arbitrary arrest, detention or exile.” Article 9 of the International Covenant on Civil and Political Rights similarly provides: “no one shall be subjected to arbitrary arrest, detention or exile.” The deprivation of physical liberty (arbitrary arrest) constitutes a crime against humanity under Art. 7 (e) and (g) of the Rome Statute if there is evidence to show that the deprivation occurred as a result of systematic attack on a civilian population and in violation of international fair trial guarantees. The statements of the victims interviewed by VOA reporter Solomon appear to provide prima facie evidence sufficient to trigger an Article 7 investigation since there appears to be an official policy of systematic targeting of Muslims for arbitrary arrest and detention as part of a widespread campaign of religious persecution. The new prosecutor for the International Criminal Court, Fatou B. Bensouda, should launch such an investigation in proprio motu (on her own motion). Meles has left an Orwellian legacy in Ethiopia. Police chief Zemedkun is only one policeman in a vast police state. He reaffirms the daily fact of life for the vast majority of Ethiopians that anyone who opposes, criticizes or disagrees with members of the post-Meles officialdom, however low or petty, will be picked up and jailed, and even tortured and killed. In “Mel-welliana” (the Orwellian police state legacy of Meles) Ethiopia, asking the name of a public official is a crime subject to immediate arrest and detention! In “Mel-welliana”, thinking is a crime. Dissent is a crime. Speaking the truth is a crime. Having a conscience is a crime. Peaceful protest is a crime. Refusing to sell out one’s soul is a crime. Standing up for democracy and human rights is a crime. Defending the rule of law is a crime. Peaceful resistance of state terrorism is a crime. It seems police chief Zemedkun is more of a police thug than a police chief. But listening to Zemedkun go into full meltdown mode, one cannot help but imagine him to be a cartoonish thug. As comical as it may sound, police chief Zemedkun reminded me of Yosemite Sam, that Looney Tunes cartoon character known for his grouchiness, hair-trigger temper and readiness to “blast anyone to smithereens”. The not-so-comical part of this farce is that police chief Zemedkun manifests no professionalism, civility or ethical awareness. He is obviously clueless about media decorum. Listening to him, it is apparent that Zemedkun has the personality of a porcupine, the temper of a Tasmanian Devil, the charm of an African badger, the intelligence of an Afghan Hound and the social graces of a dung beetle. But the rest of the high and mighty flouting the Constitution and abusing their powers like Zemedkun are no different. The singular hallmark — the trademark — of a police thug state is the pervasiveness and ubiquity of arbitrary arrests, searches and detentions of citizens. If any person can be arrested on the whim of a state official, however high or petty, that is a police state. If the rights of citizens can be taken or disregarded without due process of law, that is a dreadful police state. Where the rule of law is substituted by the rule of a police chief, that is a police thug state. Rarely does one hear human rights abusers publicly showing their true faces and confirming their victims’ allegations in such breathtakingly dramatic form. Police chief Zemedkun gave all Ethiopians a glimpse of the arrogant and lawless officialdom of Post-Meles Ethiopia. It is a glimpse of a police state in which an ignorant local police chief could feel so comfortable in his abuse of power that he believes he can travel to the United States of America and arrest and detain a journalist working for an independent agency of the United States Government. If this ill-mannered, ill-bred, cantankerous and boorish policeman could speak and act with such impunity, is it that difficult to imagine how the ministers, generals, prosecutors, judges and bureaucrats higher up the food chain feel about their abuses of power? Let there be no mistake. Zemedkun is not some isolated freakish rogue police chief in the Ethiopian police state. He is the gold standard for post-Meles governance. There are thousands of Zemedkuns that have infested the state apparatus and metastasized through the body politics of that country. For these Meles wannabes, constitutional accountability means personal impunity; illegal official activity means prosecutorial immunity; moral depravity means moral probity and crimes against humanity means legal impunity. Cry for our beloved Ethiopia! !